Long weekends today aren’t the same thing they were, say, 4 years ago. No possibilities for loafing around any more! Instead, our offspring expect us to produce three days of solid entertainment for them. This job is harder when you have three days of cool, wet weather to work with, which confined us to indoor activities. Maybe this is what a cruise director feels like. 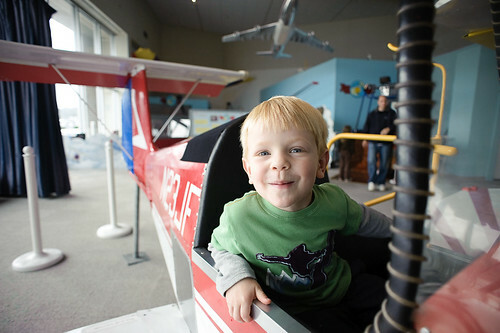 We did try one new thing this weekend: The Museum of Flight. Molly had been once, years ago. For me, it was my first trip. My verdict? It’s no Air & Space Museum, but it’s still quite nice. Alex enjoyed sitting in the different airplane cockpits. Patrick, though, is too young to really enjoy anything there. I don’t know if we’ll be returning soon to the museum, but I predict that we’ll get many solid years of entertainment & education out of it when the kids are just a little older.